Available now from Polaris Industries , the new midsize Ranger 500 EFI utility terrain vehicle (UTV) features electronic fuel injection and a single cylinder 32 horsepower engine, making it powerful enough to tow 567kgs and carry up to 226.8kgs in the rear dump box. The Ranger 500 EFI UTV's on demand true AWD keeps the operation moving, automatically engaging all four wheels when more forward traction is required, and reverting back to 2WD when it is not. When in 2WD, the Turf Mode switch unlocks the rear differential for easier, tighter turns that will not tear up the grass. The rear dump box on the new Ranger 500 midsize UTV features gas-assist dumping operation and features the exclusive Lock & Ride cargo system that accommodates many hard-working accessories that can go on and off in seconds. Polaris Industries' smooth Independent Rear Suspension (IRS) has 22.9cm of travel and five-point adjustable preload so operators can stiffen the suspension for heavy loads. The MacPherson Strut independent front suspension has a long 20.3cm of travel. The ergonomics of the cab on the Ranger 500 EFI midsize UTV deliver optimal driver and passenger comfort, with extra legroom and an easy cab slide through design which allows two adults to get in and out quickly. 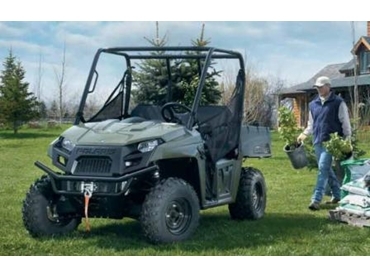 Midsize Ranger 500 EFI utility vehicles also feature standard equipment that includes a new speedometer and an instrument cluster with electronic fuel gauge.